Why would I need self storage in Roswell, GA? There are a variety of reasons why you might need self-storage in Roswell, GA.
How much is a storage unit in Roswell, GA? The cheapest storage unit in Roswell, GA is $26.00 per month. What size storage units do you have available in Roswell, GA? In Roswell, GA we have sizes that range from 5'x3' to 15'x40' to suit your storage needs. How much is it for a 5'x3' storage unit in Roswell, GA? The cheapest 5'x3' storage unit in Roswell, GA is $47.00 per month. Roswell, located in north Fulton County, is one of Georgia's largest cities. It's a scenic city, home to several creeks, a portion of the Chattahoochee River and Bull Sluice Lake. Its picturesque setting is one of the reasons it's been named one of the best places to live in the metro area, combined with its many historic homes and plentiful amenities. In 1830, American businessman Roswell King passed through the area where Roswell now sits and realized that Vickery Creek held great potential for powering a cotton mill. The fertile land that surrounded the creek also held promise, making it possible to put cotton production and processing side by side. 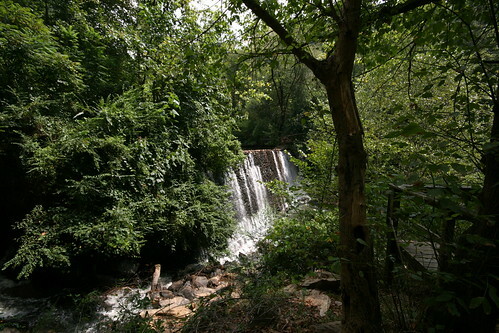 In the mid-1830s, he returned to the area, constructing Roswell Mill. As the mill grew rapidly, he added additional mills, work housing and town buildings, establishing an early infrastructure for the town. He was soon joined by several investors, and the area was eventually largely owned by three main founding families: the Kings, the Smiths and the Bullochs. During the Civil War, many of the mills were destroyed. However, Barrington King (the son of Roswell King) returned to the area after the war and rebuilt. Although the area suffered an agricultural depression for some time, it recovered and began to grow and develop once again. Its original purpose as a textile-manufacturing hub has evolved, and Roswell has become a vibrant city with many industries within its limits. As one of the largest cities in Georgia, Roswell offers the best of both worlds: the convenient amenities associated with big cities and the friendliness and charm you'd find in a small town. You can choose to live in an urban environment or in the suburbs, depending on your preferences. You'll find historic homes and landmarks in Roswell, as well as the Chattahoochee Nature Center, which invites visitors to hike miles of wooded trails or to train their binoculars on native birds. Many local festivals help promote the community atmosphere in Roswell, from the Roswell Arts Festival in September to the Riverside Sounds Concert Series during the summer. Everyday amenities like grocery stores, coffee shops, fitness centers and restaurants are also plentiful, adding convenience to the Roswell lifestyle. In addition, low crime rates make it an attractive place for both families and young singles to call home. The Fulton County Schools System manages the public schools of Roswell. You can also enroll your child in one of the city's several charter or private schools, many of which are very highly-rated. Utilities: The city of Roswell oversees the distribution and billing of residential water. Georgia Power is the city's electricity provider. Garbage and Recycling: You'll receive a disposal can for your trash and recyclables. You can expect curbside collection once per week. Transportation: Two MARTA bus routes serve the city of Roswell, and you can board the GRTA Xpress in the nearby town of Johns Creek. In Roswell, the median home price is quite a bit higher than the national average, and is even more expensive than the Atlanta metro average. This is largely due to its high desirability as a family-friendly suburb. Rent prices have remained fairly stable in recent years, making that an affordable option for many. Our lowest priced units in Roswell, GA average $46.39 per month. 814 people have reserved units in Roswell, GA in the past 30 days. There are 18 locations within Roswell, GA's city limits. There are 15 locations in Roswell, GA that offer AC and Heating features.